Growing up is never easy ... especially in a rough parochial school where scores are settled on the playground. Between bullies stealing your lunch money, fights breaking out left and right, and schoolmates tattling to the ever-present nuns, a kid just can't catch a break ... or a kiss, as the case may be. Because you're a lover as well as a fighter, and all you really want is to steal a kiss from your sweetheart across the blacktop before the school bell rings and recess is over. The fact that you've bet the last of your lunch money on being the first do it makes it all the more risky. Of course, might makes right here on the playground. If you can't win your money back from the other kids, you can always beat it out of them. Recess is a strategy board game for three to five players. 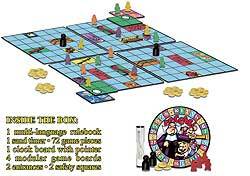 Players each start with two boy figures and two girl figures on opposite sides of the grid-marked modular board, which is dotted with playground-themed obstacles. Children move like a rook in chess, while nuns move like a queen. A child that lands on a space occupied by another child starts a fight and takes a coin from him. Other children can break up a fight by landing on that same space, or tattle by landing on a nun's space. If a nun moves onto the fight space, the attacker is sent back to the entrance for detention. Finishing thirty of the minute-long turns marks the end of the game, or it ends immediately when one player's boy and girl figures meet on the same space while out of sight of the nuns. The resulting kiss earns two coins from each player, but to win you still have to end up with the most coins.